A powerful, moving and ultimately heart-wrenching story for young teenagers, set in World War One. The author ably conveys how war affects everyone its a superb meditation on war and the devastating effects it has on soldiers and their families. Illustrated throughout with b/... read full description below. 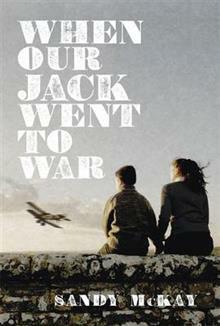 A powerful, moving and ultimately heart-wrenching story for young teenagers, set in World War One. The author ably conveys how war affects everyone its a superb meditation on war and the devastating effects it has on soldiers and their families. Illustrated throughout with b/w drawings, newspaper headlines of the times and WWI graphic images. Its 1917 and Jack enlists. And although Tom is envious of his elder brother he soon changes his mind as the reality of war becomes more apparent. Tom is almost 13 years old. We follow Jacks story through his letters home and through the eyes of his younger brother. Tom writes about life at home in New Zealand: living with Mum and their young sister, Amy, learning to hunt with his uncle, getting a puppy and learning to knitfor the war effort. When Our Jack Went to War is a fictional account of a real life tragedy. It is based on the authors research into the death of her own great uncle who died in 1917. Sandy McKay is an experienced writer for children; she is the author of over 12 titles, most notably, Recycled, My Dad the All Black, Losing It and One Stroppy Jockey. She's a recipient of the Dunedin College of Education Writer in Residency, and her books have been short-listed for the NZ Post and LIANZA awards and have been listed as Storylines Notable Books. Sandy won the Junior Fiction Category of the NZ Post Children's Book Awards for Recycled. Her landmark book, Losing It, was short-listed for the Esther Glen Award and dramatised by Radio New Zealand.